Whoops. I appear not to have blogged since March despite having done a fair bit of travelling. My bad. But thanks to Sophie, I’ve been inspired to get going again, as she’s nominated me to take part in Tripbase’s ‘My 7 Links’ project, which is basically a great excuse for me to have a read through my own archives and pull up some of my favourite old posts, I’d been meaning to do something like this for a while and now I have a good excuse to. Apologies to those of you who’ve seen these before, if not, hope you enjoy. As any reader of this blog will know, I *love* mountains. 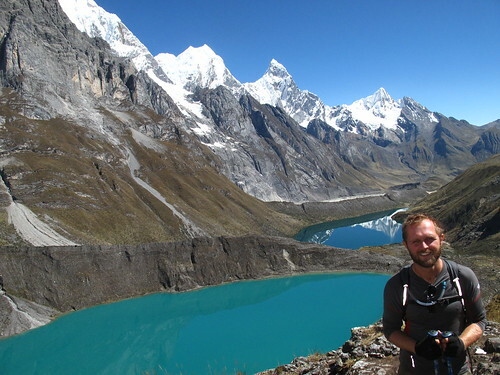 And the most beautiful mountains I have ever seen are in the Cordillera Huayhuash, in the Peruvian Andes. The nine days I spent hiking there in the summer of 2009 was just one long procession of staggering views of deep blue lakes, shining white snow-capped peaks, lush valleys and breathtaking sunrises. I had a lovely, relaxing time in Taganga, Colombia, but I had no idea how popular this post would be as it’s not exactly a huuuuge tourist destination. But two years on it’s still one of my most read posts each week, getting more traffic from Google than any other post of mine, as well as more referrals from Lonely Planet. It’s just about to top 5,000 views and shows no signs of slowing up yet. I’m not really in the habit of writing controversial posts. But another post about Colombia really annoyed a local. She wasn’t happy about me slagging off Bogota, and got quite cross in the comments box. But hey, you can’t love everywhere, and I still think it’s one of my least favourite cities in Latin America. The rest of the country is lovely though. Based on which links people click on, then my most helpful post by far is this one about my favourite hostels in Latin America. I was just trying to give a little love back to the owners of some of the amazing places I stayed in during my seven months there, and it’s nice to see that over 1,500 people have clicked through to their various websites. 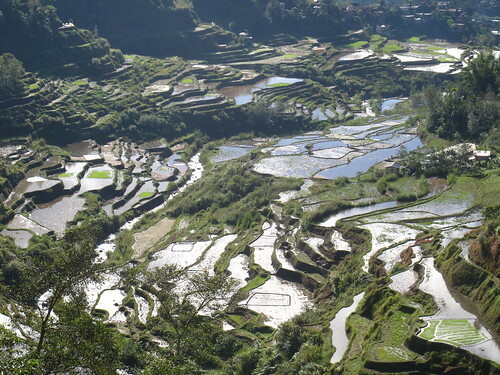 I was quite pleased with my post about Sagada, in the Philippines when I wrote it. I certainly never expected it to be my first post to appear on the WordPress homepage. It gave me easily my biggest one day traffic to date, and also got the post more comments than usual. I have a feeling it was the photo of the stunning rice terraces that did it. 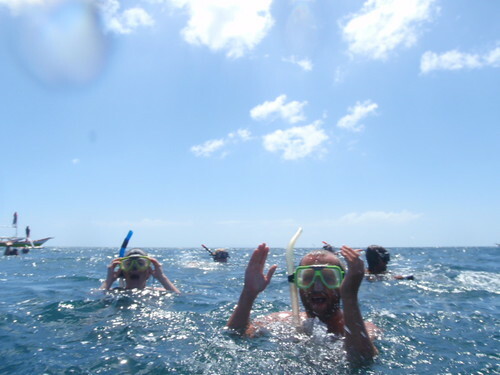 Generally my posts about the Philippines did really well – but weirdly, the one about my favourite experience in the country, snorkelling with whale sharks is one of my least-viewed posts of all time. Reading back, I’m not sure I quite got across quite what an incredible experience it was. Impressions of Mexico was my attempt to sum up why I completely fell in love with Mexico during my seven weeks there in 2009. There are so many things I adore about the place, and even though I visited a further 18 countries on my round the world trip, it’s still my favourite. Lots of negative news reports have put lots of people off visiting the country, which is a real shame, as most of it is still very safe to travel in, and I’ve always hope this post can do a little bit towards combatting some of those negative perceptions. …and the final part of the My 7 Links game is that I’m supposed to nominate 5 other bloggers to take part, but I can only think of two other travel bloggers I know who haven’t done this yet so that will have to do for now. Now that felt like a nice way to start writing again, promise it won’t be so long next time, as writing this has got me going again and I now have four more posts coming up, starting with my recent trip to Austria and Slovakia. Travelling for a year, constantly on the move, rarely staying more than three or four days in one place, where I end up staying makes a huge difference to my my stress levels. End up in a nice hostel, with things like comfy beds, warm showers, free breakfasts, a good location and a nice atmosphere keeps me far more relaxed and happy than when I’ve been unlucky enough to end up in somewhere lacking some or all of those factors. Luckily, I’ve been very pleasantly surprised to find the vast majority of places I’ve stayed in have been brilliant. Finding the good ones isn’t too hard either – best of all is to get personal recommendations from other travellers, failing that, a quick look on hostelworld or hostelbookers gives a pretty good (and crucially, up to date) steer on where’s good. One of the main reasons to avoid using guide books is that new hostels are opening all the time, and in many places the best hostels have only opened recently. Seeing as personal recommendations are the best kind, I thought I’d thank some of the best places I’ve stayed in by giving them a bit of a plug here – I make no apologies for the fact this list is entirely subjective (it’s not like I’ve been everywhere in Latin America, and I only ever stayed in one place in each town). But I reckon if you happen to be a budget traveller in any of these places and choose to stay in them, I hope you won’t be disappointed. This one has pretty much everything going for it – Dante is the perfect host, welcoming new arrivals with a beer and a brilliant explanation of everything to do in the fantastic city. His mother is an amazing cook, and the free breakfasts (including fresh fruit, a cooked breakfast, delicious fresh smoothies and coffee) cooked by his mother are the best I had in any hostel by far. Add to that the peaceful roof terrace with views all over the city, and wonderful personal touches like the fact they fly flags on the roof for every nationality staying there on a given night (although let me know what Dante does if you happen to stay there and come from a small country he doesn’t have a flag for) and you have a real home from home. The Hostel Lao probably had the friendliest atmosphere of any hostel I stayed in. And it definitely had the friendliest (and possibly maddest) dogs too. There’s a huge garden (with a pool) too, and the weekly barbecue is really not to be missed – I’m not sure I’ve ever seen that much meat (and the salads are pretty awesome too). There can’t be many backpacker hostels in the world that have a chef who cooks posh restaurant quality food. Casa Felipe is certainly the only one I’ve ever come across. Great breakfasts too, and the rooms are really spread out, each with their own hammock, and with a lovely shaded outdoor seating area for chilling in, this is the perfect place to relax and recover after trekking to the Lost City. This is also one of the few where it’s definitely worth booking ahead – it’s always full. 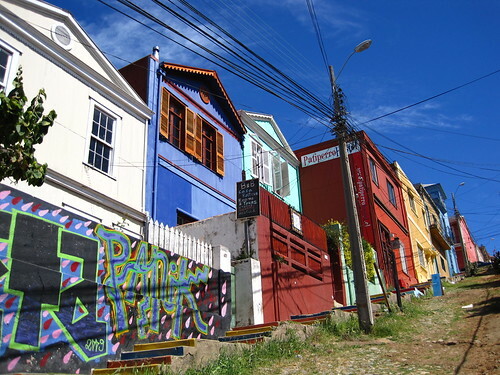 Valpo was my favourite city in Latin America, and a not insignificant part of my enjoyment was the wonderful Patapata. It’s in a big old 19th century townhouse on the best of the city’s hills, and is another family run place that really has a proper family feeling. Another place with great breakfasts too. 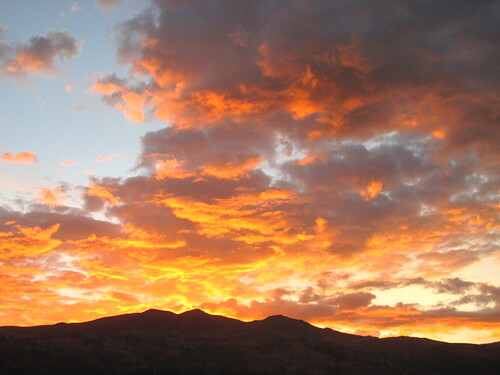 Huaraz is a hikers’ and mountaineer’s town, and if you are either of those, Albergue Churup is the perfect place to stay. It’s really popular with the serious outdoor types, which can help if you’re looking to join up with people for activities. Best of all is the top-floor communal area, with huge windows giving perfect views of the mountains (and even better ones from the outside terrace), and a coal fire to keep you warm on the cold mountain evenings. Really hot showers are also an essential after a big hike, and they don’t disappoint. Yet again (bit of a theme developing here from me) the breakfasts are great (I can highly recommend the banana pancakes before a big day of activity). If you’re diving, this is the best bargain in the Americas I reckon. For a start, you get free accommodation if you’re doing a course. Even when you’ve finished a course, divers get a special rate, which was easily the cheapest I paid anywhere (just over $3!). 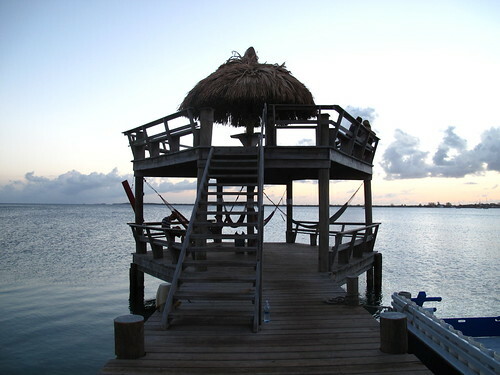 And for that, you can get a room right on the dock, with beautiful views across Utila harbour. Hammocks on the dock are perfect for chilling too, there’s a bar right on the dock too and a weekly sunset booze cruise (more civilised than it sounds) and barbecue too. In fact if they just did decent Baleadas (yummy Honduran street food) I would barely have needed to leave the place the entire time I was there. It’s in one of the best locations on the island, sitting right on the edge of the ocean facing some of the island’s most dramatic waves. The beds are comfy, the showers are hot, and there are not one but two decent sized kitchens. Marta is the perfect host too. And best of all, it’s the cheapest place to stay on what is a pretty pricey island. Cartagena is HOT. Ridiculously so. And very humid too. Walking around the city by day is a sweaty and tiring experience. So what you need is a hostel with somewhere to cool down. The Medialuna has two: a pool in the downstairs courtyard, and a nice high roof terrace that frequently gets a breeze that’s missing at street level. Housed in a lovely, whitewashed colonial building, it’s one of the more beautiful hostels I stayed in too. One note of caution – out of all the ones listed here, this is one that can be a bit noisy at night. Bogota is COLD. In my first hostel I nearly froze to death, even in my room. The DN, on the other hand, comes with wonderfully warm, thick duvets, atop one of the comfiest bunks I’ve stayed in. It has a really friendly owner too, and is another place that does a great weekly barbecue. Margarita’s gets a bit of a knocking sometimes, because the staff can apparently be a bit pushy about tours (although they weren’t to me), and admittedly the rooms aren’t quite up to the standard of most of the rest on this list. But it earns it’s place here for one very good reason – value for money. It was the cheapest hostel I stayed in Mexico, and yet it included not only a two course breakfast, but also a huge three course dinner – unique amongst all the places I stayed in. That’s it for Latin America now – posts on New Zealand, Australia & Indonesia will be on their way soon as I work through my backlog of posts! You can subscribe for updates by RSS or email using the links in the top right. Amongst the global backpacking crowd, countries don’t get much cooler at the moment than Colombia. While I was researching my trip, Colombia wasn’t even on my original itinerary. After hearing people rave about it, and in particular how much safer it is now, it became a must see. 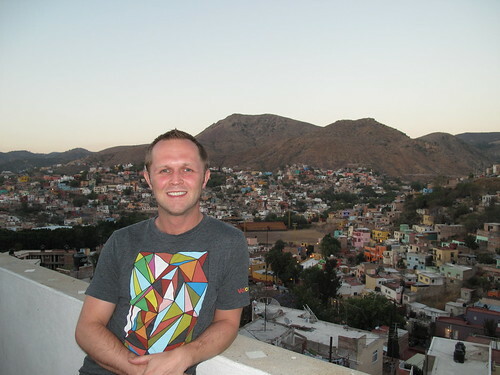 When I got to Mexico, the excitement continued to build. Pretty much every traveller I met who’d been there couldn’t wait to tell me about how it was the best country they’d ever been to, and that anyone still worried about security concerns (outside of the Amazon areas) really had no right to be backpacking in the first place. After being warned about Mexico and Guatemala (and realising how over-cautious those warnings were), I arrived in Colombia ridiculously excited and not at alll apprehensive. Big Mistake. Unduly raised expectations are a dangerous thing. The taxi drive into Bogota revealed a city that looked like one of London’s uglier suburbs (although god know what I was expecting. Latin American capital cities are frequently ugly, and even the nicer ones still have plenty of ugly bits). My first encounter with travellers in my hotel was with three others who’d been there a few days. All had been mugged. My excitement soon faded to disappointment and apprehensiveness. After emptying my wallet of everything and leaving my camera behind, I ventured out to explore, and the feelings persisted. The main square was nothing special after seeing so many amazing ones elsewhere. The colonial buildings were a bit drab. And much of the archtitecture was pretty bland. It didn’t help that my first two days were a public holiday, and everything was shut as all the locals had left town for the weekend (I could see why). Oh, and it rained most of the time too. I spent a couple of full days there, punctuated by further tales of muggings, but I soon realised my heart wasn’t in it, and so my planned week was cut to three nights, and I left as early as I could once a plan had been formed. Not a patch on your average Mexican cathedral. In retrospect, the fault was mine and not the city’s. Raising one’s expectations so high is a very dangerous game. Nowhere is perfect, and I have no idea how I allowed myself to think that somehow Colombia could be. Writing this a week later, I think my initial impressions were harsh, and I really didn’t give the city much of a chance. I have to back at the end of the month to fly to Lima, and I’m determined to give it a fair chance, this time with more realistic expectations – and I’ve spoken to other traveller since then, and it seems like I’ve unfairly judged the place, and it’s my own fault. You can see my slightly disappointing photos of Bogota here if you really have nothing better to do.